The JAZZ 6T‐DUAL is an automation platform configured for use of our PL Series Applicators to apply die‐cut parts to items presented on a servo actuator XY Table. The XY Table strokes are 600mm in both the X and Y axes. 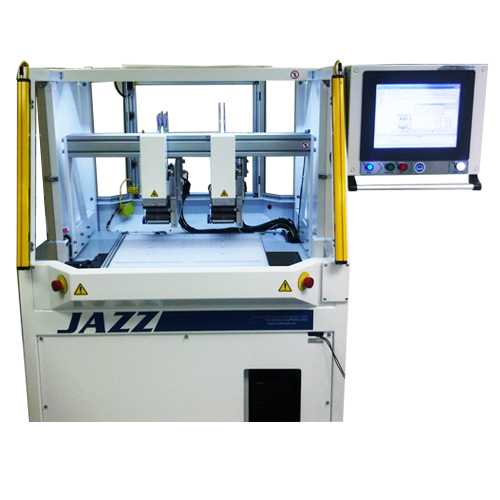 The JAZZ 6T‐DUAL can be configured with up to three PL100 Series Applicators mounted above the XY Table. The 6T‐DUAL enclosure is a safety rated system that includes a Light Curtain interface at the front and properly rated safety hardware on all entry doors. The 6T‐DUAL has been CE marked per the applicable Machinery Directives. The system is based on a welded steel frame construction with white powder coat finish and includes our pre‐ configured PC‐based control system and HMI interface panel. This system is ideal for placing adhesive parts on substrate components that are presented in arrays, such as trays of components. The customer may choose to load substrate components manually or may also choose to use their own robot or other automation to load and unload the substrate components.